While I’ve focused almost entirely on the fun stuff, our days were largely spent studying at the famous journalism school, the Poynter Institute. We heard programs on everything from topic trends to useful software. This cartoon hung on the wall at Poynter reminded us that, while writing is a serious business, it’s good to see the lighter side of it. Definitely worthwhile, but it meant we saw a lot less than if we were on vacation. The conference kept me too busy to get to the Sunken Gardens, which were the first thing suggested by just about everyone I asked for recommendations. I also missed the Dali Museum, which got rave reviews. I never got to the beach, and I learned too late that there is still a place in St. Pete that serves smoked mullet. Plus there are all the other delights of the area. I’m determined to dine someday at Bern’s Steak House in Tampa. I want a full meal, and not just a snack, at Columbia. Plus I want to visit again some of the places from long ago—the Ringling Estate, Tarpon Springs, Fort De Soto. And I’m certain that when I check out sites such as Visit St. Petersburg-Clearwater and Visit Tampa Bay, I’ll find even more things to lure me back to the area. So farewell for now, Tampa Bay. I’ll definitely be looking for an opportunity to return. Tampa has in the last few years experienced an explosion of craft breweries, which seems to be happening in a lot of places, largely as a result of so many folks losing high-paying jobs and figuring that, if they can’t make a lot of money, they might as well have a lot of fun doing something they love. I’m not a beer drinker, but I know enough people who are that I figured this was worth passing along. One of the more remarkable places we visited was the Epicurean, a new food-focused hotel created by the owners of Bern’s Steak House. The hotel features a cooking school, organic greens growing on the walls in the main restaurant, and gourmet amenities in the guest rooms, from butcher blocks and wine coolers to delightful goodies in the stocked fridge. And it’s across the street from the steak house and its remarkable wine collection, so one need not drive home if one samples a bit too much of that collection. A lot of the new restaurants in the area are focusing on artisanal foods and beverages. Haven was remarkable for having the fabulous, climate-controlled cheese locker shown below, which both displays and protects their remarkable, international collection of cheeses. 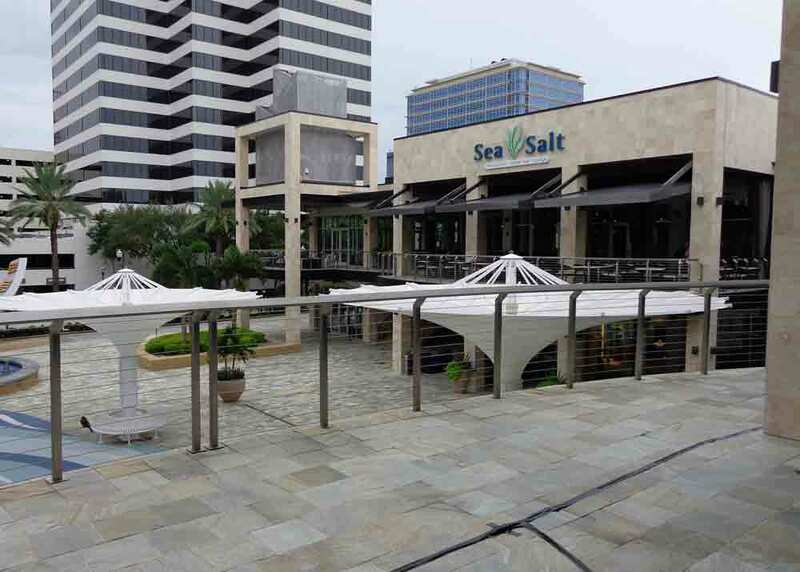 Ulele (pronounced You-lay-lee; it’s the name of a legendary Native American princess) has the advantage of lovely views across the Hillsborough River, great gardens, and a fabulous building: the repurposed 1906 Tampa Water Works Building. Ulele focuses on the abundance of Florida, particularly indigenous ingredients. Everything we ate there was just crazy good, but the standouts for me were the alligator hush puppies, spicy lobster cakes, garlic-laden charbroiled oysters, Ulele salad (greens, cheese, beans, roasted peppers, onions, and a balsamic vinaigrette) and the crab mac and cheese. Everything was good, but those were the “wows” for me. The house-made ice cream was pretty special, too. So Tampa is definitely a good choice for people who like to eat. The Columbia Restaurant was the only food destination from my childhood that I was able to revisit on this trip. It was as fabulous as I remembered—not just the food, but the décor, the Old World charm, the sky lights and balconies, and most especially the gorgeous tile work inside and out. The Columbia is the oldest restaurant in Florida, having opened in 1905. It was created by Cuban immigrant Casimiro Hernandez, Sr., and is now run by the fifth generation of the founding family. I love that kind of history. As well as being the oldest restaurant in Florida, it is also the largest—and in fact, according to their website, is the largest Spanish restaurant in the world. Everything I have ever eaten there has been wonderful, but they are particularly known for their Cuban black bean soup, sangria, flan, “1905 salad,” Cuban sandwich, and seafood dishes. Over the years, a few other locations were opened for the Columbia, including what is now the oldest restaurant in Sarasota. But the original Columbia is at the outer edge of Ybor City in Tampa. Ybor City is a National Historic District that has been home to a wide range of immigrants over the years, most especially Cuban, Spanish, Italian, German, and Jewish. Ybor City is now a top destination for cigar aficionados, as the main street is lined with shops carrying hand-rolled cigars. We explored the length of 7th Avenue, enjoying the historic markers, statues, and old buildings, and stopped in a couple of cigar shops to watch the artisans at work, appreciating the care and skill needed to make really good cigars. Then, we headed for the Columbia. Should you get to Florida, here is more information on the Columbia Restaurant (including a lot more history, plus the menus) and on Ybor City (again, more history and lots of useful information for visitors). In Tampa, we divided the time we had between new developments and iconic classics. Among icons, it’s hard to beat Bern’s Steak House, which opened in 1956. Remarkably, it is still in the same family, run by the heirs of Bern Laxer, for whom the restaurant was named. While it is famous for its steaks, Bern’s is even more remarkable for its wine collection. There are more than 100,000 bottles in the restaurant’s cellar plus another half a million in the nearby wine warehouse. It is the largest wine collection in the world owned by one restaurant. Number 2 is the Tour d’Argent in Paris. The oldest bottle here is an 1813 port, but the costliest is a 1947 Chateau Latour. One small part of the wine cellar at Bern’s. The ambiance is probably also a big draw. The lobby has a decidedly European castle feel to it, with soaring stone walls covered with art. There are seven dining rooms, each named for a wine region or a dominant design elements (such as the Bronze Room). When one is finished with the meal, one can go upstairs to the dessert rooms, which are astonishing. The dominant feature of the room is a stunning amount of gorgeous, highly polished wood, which divides up the room, making it a popular place for things like marriage proposals or other transactions that might benefit from a touch of privacy. Near each table, there is a telephone, which can be used to call the pianist, for special requests. Ahead: another old Tampa icon, and then some new Tampa trends and destinations. As I mentioned a few posts ago, the reason I was in Florida was for a food-writers conference, and we spent several days listening to great speakers on topics ranging from marketing your writing to how to describe Florida food. Cookbook author Nathalie Dupree was on hand to tell us about traditional Florida cooking–not the fabulous, innovative stuff we were experiencing at the restaurants we were visiting, but the kind of fare that has been foundational and long-standing. Dupree noted that her introduction to Florida’s cuisine was in the book Cross Creek, by Marjorie Kinnan Rawlings. While my intro was my dad and visits to Florida, I’ve read Cross Creek, and its descriptions of Rawlings’s creamed crab, with milk from her own cow and crab caught only hours before, the fish fries and hush puppies, and the fresh fruit make the food of the era (1920s) in Florida sound not only appealing, but worth carrying on. Florida’s traditional cuisine blends elements of Southern food with Caribbean, especially Cuban, but with considerable influence from African American and Spanish cultures. Dupree related that, in much of Florida, you are often served black-eyed peas, coleslaw, and crab cakes for lunch–which is very Southern. The American South stretches from Maryland to the southern tip of Florida, but of that 2,000-mile coastline, almost half of it is Floridian. If you add in all the rivers and lakes, Florida has 11,000 miles of waterways. Hence, the focus on seafood. The South has fried pies because no one would light the oven in Florida in August. “Streak of lean” is the Southern name for belly bacon. The Virginia Housewife, a cookbook written in 1824 by Mary Randolph, includes a recipe for gazpacho, underscoring how far north Spanish influence reached. This is not the first time I’ve heard Nathalie Dupree speak, and she always comes armed with wonderful stories and anecdotes. So if you have a chance to hear her, take it. If you don’t have that chance, there are always her cookbooks. I had heard the term “Florida Cracker” before this trip, but had never heard it explained. The term comes from the early days of Florida settlement. When Spanish explorers in the early 1500s failed to find gold, silver, or the fountain of youth, they headed back to the well-established Spanish colonies in Mexico and South America, leaving behind all the livestock they’d brought with them, including large herds of cattle and many horses. The animals became feral and adapted to the Florida climate. When English settlers began arriving, about a century after the Spanish had left, they found the makings of a cattle industry just waiting for those resourceful enough to take advantage of the by now substantial, if wild, herds of livestock. Some came on horseback, while others captured the wild horses abandoned by the Spanish. With nothing more than a horse and a whip with which to move the herds of cattle, these early settlers founded successful ranches. In time, they became known for the loud crack of their stock whips–hence, crackers. The small, agile, wild horses they adopted were so indispensable to the success of the crackers that they became known as cracker horses, much as mounts in the American West would become known as cow ponies. They were the horses needed by those managing cattle. However, this was long before the American West had even been explored, let alone settled. So the first American cowboys, horses, and cattle ranches were all Floridian. Even today, Florida is a major beef producer, and Florida Cracker culture lives on. The culture lives on, but the traditional horses were eventually replaced by quarter horses. However, efforts have been made to preserve the bloodlines of the handsome, little Florida Cracker Horse. Here’s a video about their history and those efforts to keep them around. St. Petersburg’s Locale Market was astonishing in every way. Shelves were lined with glorious packaged foods and confections. Glass cases showcased glorious meat, fish, house-made sausages. Various prep kitchens were bustling with cooks creating dishes that could be eaten on the patio outside or taken home. A glass wall offered a view of handsome slabs of beef dry aging in a salt-lined vault, while the meat counter displays gorgeous cuts ready to be taken home. Wines, coffees, and teas were on offer, packaged or for consuming on the spot. 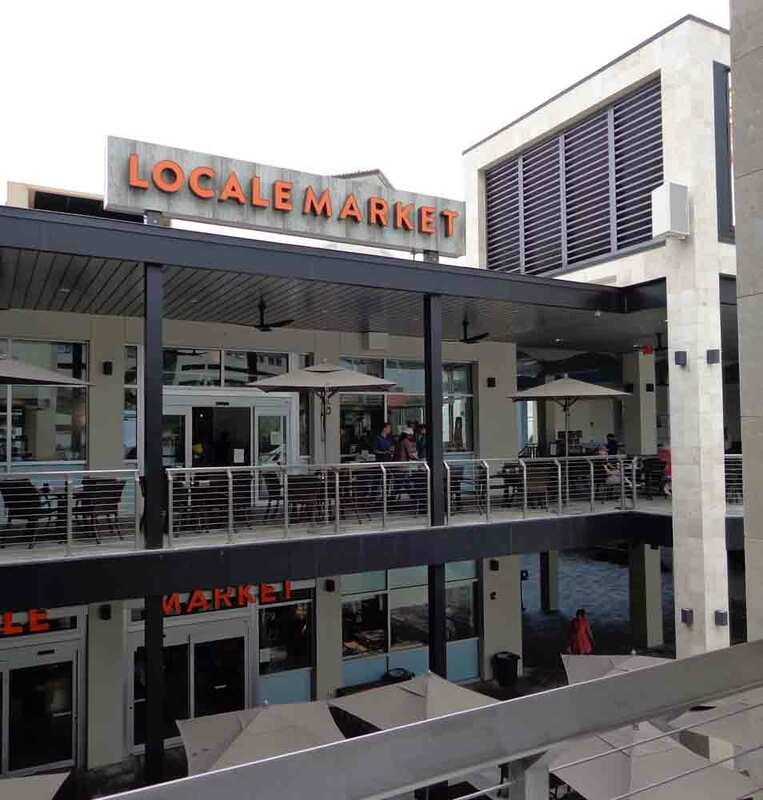 The dazzling, two-story market also has a farm-to-table restaurant on the premises, mostly outdoors, but under cover, so the weather won’t limit dining opportunities. If you love food and happen to find yourself in St. Pete, this is absolutely worth visiting. Here are a few photos, to help you envision the offerings here (and the whimsy of those displaying the foods). 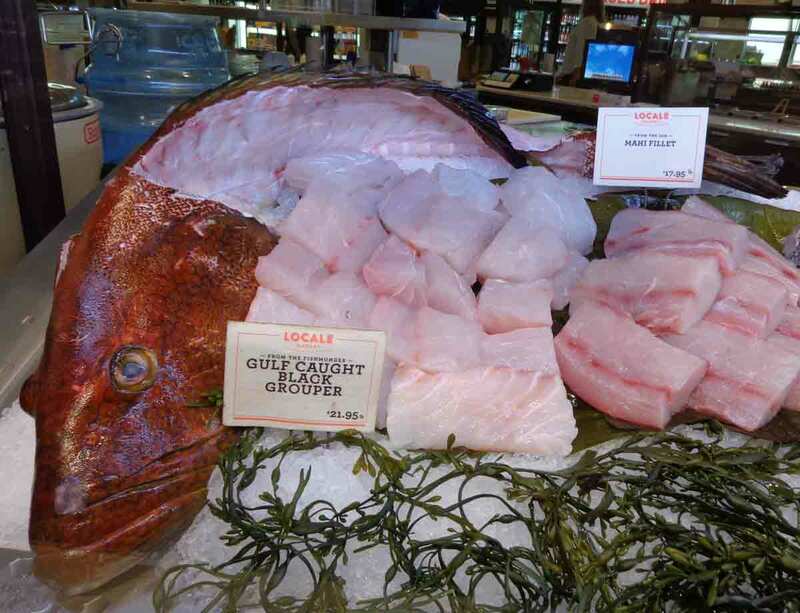 Black Grouper is an iconic dish in this area. 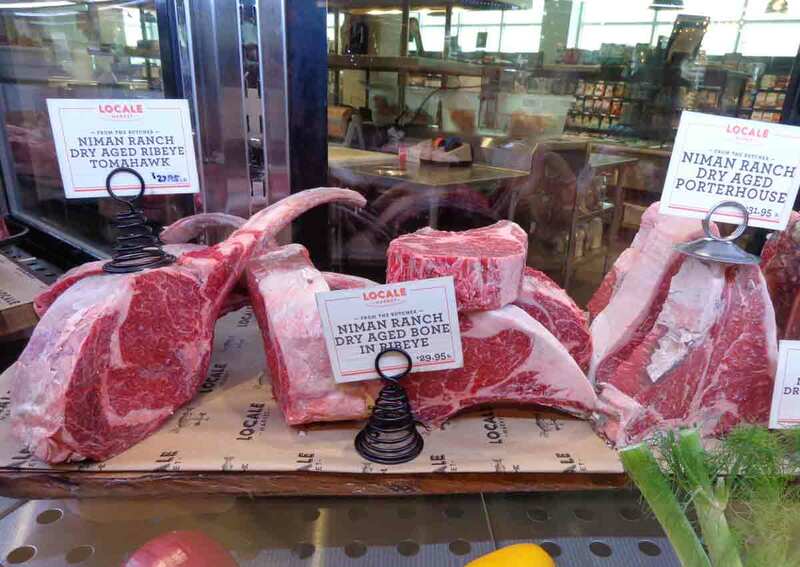 One of the kitchens is visible behind this display of exceptional beef. 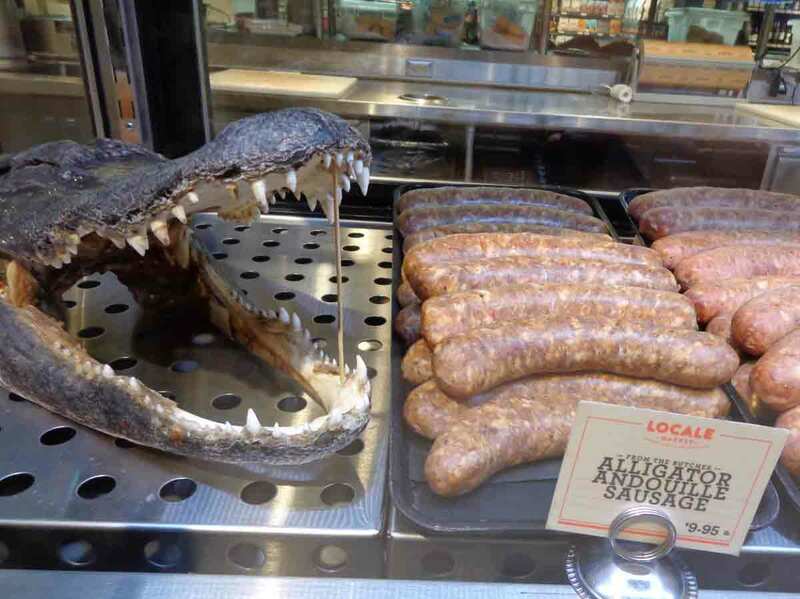 A touch of whimsy: alligator “guards” alligator andouille. From Sea Salt, we walked eastward, toward the water and Beach Drive. As it would turn out, this would just be our first visit to this waterfront roadway—and in fact this proved to be a good opportunity to note the locations of some of the places we hoped to visit later in the week. This first night, we wandered northward up the drive, stopping at a place that had been recommended to one of the other writers: 400 Beach. We sat outside, enjoying the sea breeze after a steamy day, and worked on getting to know other conference goers. We all ordered something from the sea. 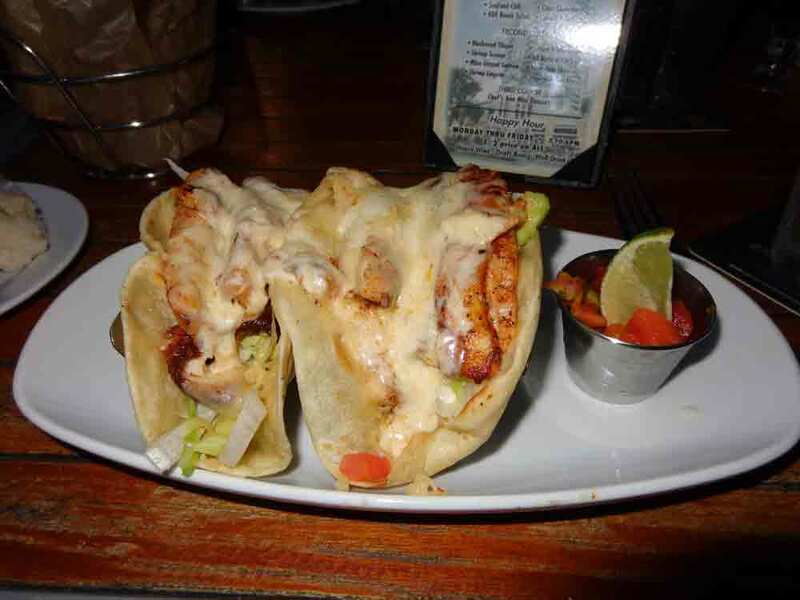 I opted for the fish tacos, which were amazing and were served with a mango and papaya salad. This was actually listed as an appetizer, but I can’t imagine eating anything after these two impressively generous tacos. We all agreed that this place was definitely a good suggestion. Across the street, we could see the Museum of Fine Arts, to which I returned the next night. Impressive collection for a small town, with many familiar names in the galleries of paintings, plus some very nice antiques, artifacts from around the world, sculpture, decorative arts, and an entire room brought from somewhere in Europe. Farther down on Beach Drive, was the Dali Museum, which I didn’t see on this trip but heard great reports from those who did. Strolling back toward the hotel, we passed Birchwood, to which we would return in a few nights for the awards banquet. Impressive food there, as well. 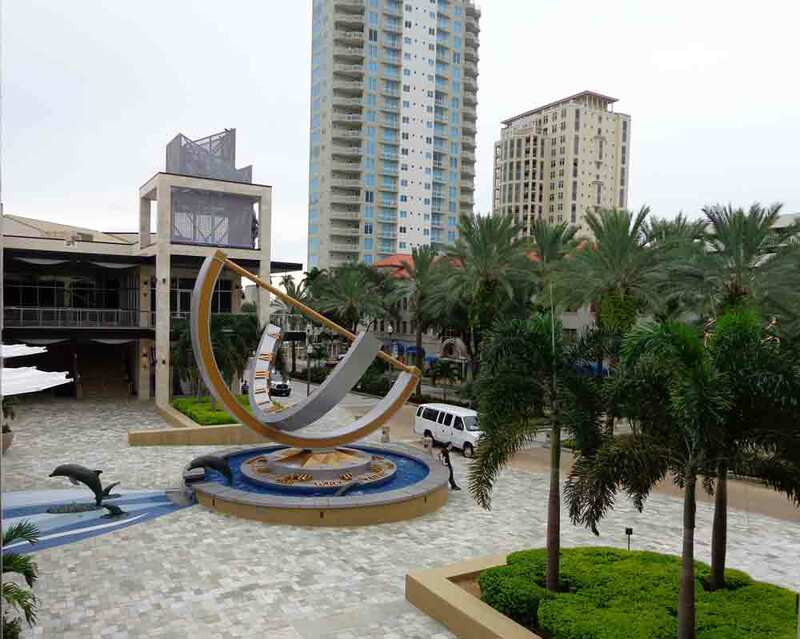 So if you are in doubt as to what to do in St. Pete, between the museums and the restaurants, not to mention the views of the parks, marina, and bay, it seems that heading for Beach Drive would be a safe bet. An important thing to know in St. Petersburg is that streets go north and south, while avenues go east and west. For example, our hotel was at the corner of 3rd and 4th – which you could only possibly find if you know that it’s 3rd Avenue and 4th Street. There are a few streets with names: Martin Luther King, Jr. Street (which, being a street, runs north and south), Beach Drive, Central Avenue (and yes, east and west). But mostly, it will be numbers—plus you need to notice whether a street is north or south, as there is, for example, a 9th Avenue S and a 9th Avenue N, Central Avenue being the dividing line for avenues. This sounds insanely complicated, but in fact, if you keep in mind the directions that streets and avenues run, all you need to be able to do to know where you are is count. Downtown St. Petersburg is quite walkable, and so those of us who showed up early for the conference accepted the recommendation of one of the event planners and hiked the three blocks to Sea Salt (on 2nd Avenue N). 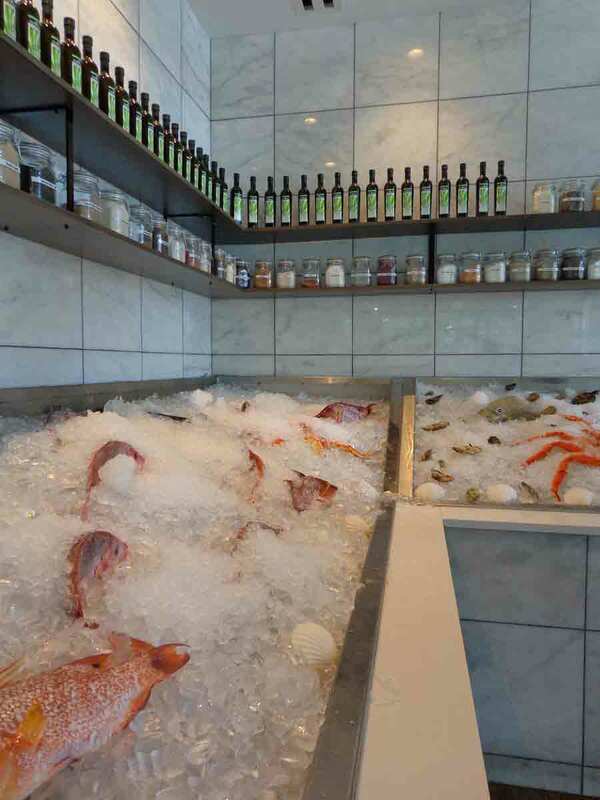 Fresh fish, different kinds of salt, and good olive oil greet customers at the entrance. Lots of folks went for the raw oyster platters. I ordered the seared sea scallops with sautéed leeks and Tasso ham in truffle cream sauce, and I was in paradise. It was just an appetizer, but my fellow writers had started talking about going out for dinner, so I figured that was where I’d stop. My dad was born and raised in St. Petersburg, Florida. As a result, while I was growing up, our family spent a lot of summer vacations visiting dad’s relatives down south. This was long before Walt Disney had even considered building anything in Orlando. We loved the beaches, and I became a world-class shell collector, combing the beaches in the early morning with my dad. But there was always a lot more than just the beaches to enjoy. A few favorite food memories are associated with these trips. Warm-water lobster was cheap enough that you could feed it to kids. Smoked mullet was one of the best foods imaginable, and they sold it from stands along the road, which made it even more fun. And black bean soup, tostones, and flan at Columbia Restaurant in Ybor City were definite favorites, as well. On top of the dining, beaches, and relatives, there were wonderful things to see and do on the Gulf side of Florida. We examined raw sponges and the brass-helmeted diving gear of Greek sponge divers in Tarpon Springs, watched entertainers at the Kapok Tree in Clearwater, got fresh seafood in Pass-a-Grille, explored Fort De Soto down on Mullet Key, and delighted in the remarkable museums on the Ringling estate in Sarasota. Then life got busy, relatives died, other destinations called, and I didn’t get to the Tampa Bay area for decades. I’d been to Miami on business and to Key West with friends, but not to the place where I’d spent so much time growing up–until last month. A writers conference offered an opportunity to find out what had changed and what was the same in the destination of my youth. The palm trees, banyans, and birds of paradise still made me smile. The red-tiled roofs of older buildings led me to wonder if the reason I fell in love so quickly with Southern California was because of the similarities of architecture and plants that were so familiar to me. I learned that Tarpon Springs was still Greek, Columbia Restaurant still had black bean soup, the Ringling Estate in Sarasota was still a destination, and Pass-a-Grille was still good for seafood–but there were a lot of changes. Roadside stands selling smoked mullet had vanished. In St. Pete, small, old-Florida architecture shared the streets with modern high-rises. While I missed a few things, I quickly learned that there were new delights, from excellent museums to sensational dining options, mixed in with the old delights of tropical ambiance and lovely beaches. There are a lot more people–but also more air conditioning, which is a good thing. The conference kept me busy most of the time, but I still managed to fit in a bit of exploring and a fair bit of excellent dining. As a result, it will take a few posts to share all that I experienced. Old and new blend in downtown St. Pete.